International Justice Mission's (IJM) new film, At the End of Slavery: The Battle for Justice in Our Time, will be shown on the following days at the locations listed below. These screenings are an excellent opportunity for further education and to invite friends to learn more about human trafficking. You can also host a screening as part of IJM's Weekend to End Slavery, November 14th and 15th. For more information, please visit http://www.attheendofslavery.com/. 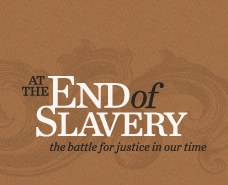 At The End Of Slavery - Extended Trailer from International Justice Mission on Vimeo.